Mahmoud Hussein. Photo courtesy of Al Jazeera. This article forms part of IPI’s #PressEgypt campaign, which aims to secure the release of the approximately two dozen journalists currently behind bars in Egypt. How can you help Mahmoud Hussein? Tweet the message below and help spread the word! Imagine spending 400 days in prison without knowing what you are charged with – or whether you will ever get out. That is the reality for Mahmoud Hussein, a 51-year-old father of nine, who is behind bars in Egypt simply for being a journalist. And he is not alone: today, Egypt is the third-worst jailer of journalists in the world, surpassed only by Turkey and China. Hussein, an Egyptian national working for Al Jazeera in Qatar, was detained at Cairo airport on December 20, 2016, after arriving to meet his family for holiday. He was interrogated for over 14 hours without a lawyer, released, and then arrested again days later. On December 25, 2016, the Egyptian authorities publicly accused Hussein of “disseminating false news and receiving monetary funds from foreign authorities in order to defame the state’s reputation”. Three videos containing apparently forced “confessions” were leaked to Egyptian media, which then portrayed Hussein as a foreign spy and a terrorist. Since then, Hussein’s detention has been renewed 11 times. But prosecutors have not brought official charges against him nor has the government provided any evidence or justification for his detention. Al Jazeera has denied all of the accusations against Hussein and has called for his immediate and unconditional release. In January 2018, the U.N. Working Group on Arbitrary Detention concluded that Hussein’s detention was arbitrary and that the conditions of his arrest and imprisonment amounted to “cruel, inhuman and degrading treatment”. 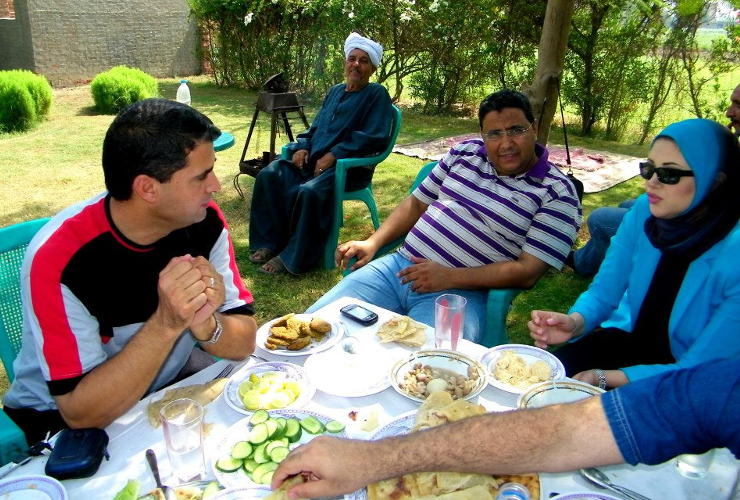 Mahmoud Hussein with several family members prior to his arrest. 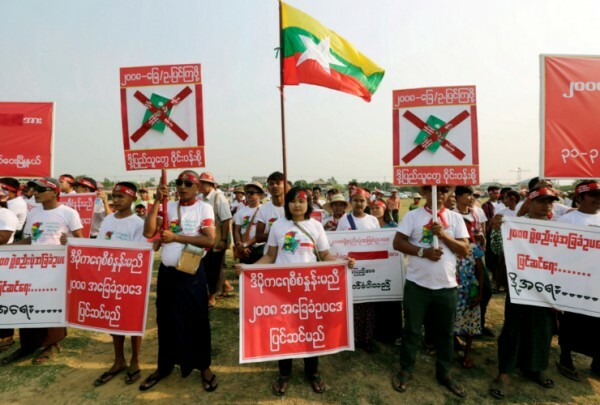 Photo courtesy of Al Jazeera. Hussein’s oldest daughter, Aya Mahmoud Hussein, is angry and disappointed at the way Egypt has treated her father and his family. In an interview with the International Press Institute (IPI), she described her father as someone who brought his children up to love their home country. Aya Hussein said her father didn’t anticipate he would be detained, even though he knew his employer, Al Jazeera, was caught in the middle in the conflict between Egypt and Qatar. He was just an Egyptian returning to his country to spend holiday time with his family. As he had not done anything wrong, nothing bad could happen to him. Or so he thought. Hussein’s family has suffered as a result of his detention. As part of the smear campaign depicting Hussein as an enemy of the state, Egyptian media also circulated pictures and information about his family and children. Hussein’s younger children have been confronted in school and asked about their father’s being a “terrorist”. His second oldest daughter, Zahra Mahmoud Hussein, was fired from her job as a trainee reporter at a TV channel after her boss found out who her father was. Zahra Hussein has now put aside her dream to follow in her father’s footsteps as a journalist and instead taken over his role as family caretaker. A journalist with more than 30 years of experience, Hussein started to grow into the profession already at an early age, according to an interview he gave to Al Jazeera’s internal staff magazine before his detention. Born in a village near the Giza pyramids and the Sphinx, young Hussein used to sit in nearby fields and listen to farmers discuss and debate different topics over tea. Hussein, the oldest of nine siblings, also liked to follow news and current affairs on the radio with his father. He was the first person in his family to attend school and later studied law and history at university. During his career, Hussein has mainly worked for Egyptian broadcasters and Arabic-language news channels. After many years of doing freelance work with Al Jazeera, Hussein joined the company full time in 2010 as a Cairo correspondent, covering the 2011 revolution and the events that followed, including the ousting of former President Mohamed Morsi in 2013, which brought current President Abdel Fattah al-Sisi to power. Egypt has traditionally never enjoyed a high degree of media freedom, but the situation worsened markedly following the 2013 coup d´état, after which Al Jazeera was forced to shut down its Cairo newsroom. After that, Hussein moved to Al Jazeera headquarters in Doha to work as a news producer. In the last few years, Al Jazeera has been repeatedly targeted by Egyptian authorities. Egypt has accused the network of supporting the Muslim Brotherhood, which it considers a terrorist organization. The government has expelled Al Jazeera from the country and arrested several of its journalists, while government supporters have attacked the company’s local facilities. In 2016, Egypt sentenced Al Jazeera Arabic’s editor-in-chief, Ibrahim Helal, to death in absentia. The U.N. Working Group on Arbitrary Detention recalled those events in its opinion last month, writing that Hussein’s “prolonged detention without trial appears to be part of the Government’s widespread crackdown on the independent media and bloggers for political opinion at odds with its own”. 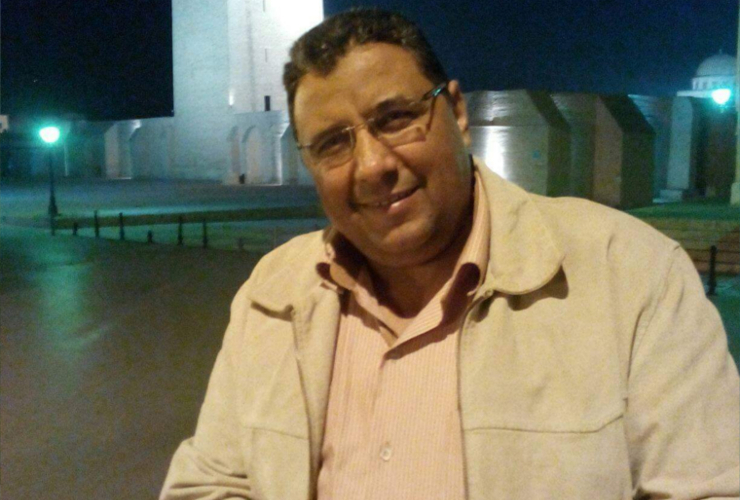 Mahmoud Hussein is missed by his colleagues at Al Jazeera, who describe him as a well-connected, professional journalist who always makes sure that every detail in his correspondence is accurate. According to his manager in Doha, Majed Khedr, Hussein “knows how news is made”. In an article published by Al Jazeera, Khedr praised Hussein’s sense of humour and his ability to “lighten the mood” in an otherwise stressful newsroom. An Egyptian prison is the worst thing that could happen to anybody, Baher Mohamed, a colleague of Hussein’s at Al Jazeera, commented in a recent interview with IPI. Mohamed knows what he is talking about, having spent 438 days in Egyptian prisons between 2013 and 2015. “Every single day in prison is a waste of life”, Mohamed said. Mohamed believes Hussein is going through the same things as he did. Hygienic conditions in Egyptian prisons are abysmal, with buckets serving as toilets and inmates suffering from occasional bouts of food poisonings. The dark and smelly cells are crawling with cockroaches, ants and other insects. Being in solitary confinement, as Mahmoud Hussein was for the first three months of his detention, is the worst thing that could happen to a social human being, Mohamed said. The tiny cells are unheated and lack electricity. There is no access to sunlight. Speaking to other inmates is not allowed. If you try, you are punished. Mohamed came up with different strategies to ease his solitude. One of them was talking to “Wilson”, who was, in fact, a vegetable. “I had an onion friend, so that I could speak with somebody”, Mohamed told IPI. Hussein currently shares a cell with three other inmates, all of whom were convicted or arrested for crimes such as murder. Mohamed says the shock of being put in these conditions together with drug dealers and killers is tremendous for someone who has never witnessed it before. Hussein is allowed to have visitors once a week. Aya Hussein, who studies in France, visited her father twice last Christmas. Hussein’s children fear for their father’s health. Since his arrest, he has lost a substantial amount of weight due to poor food quality and is suffering both physically and psychologically, his family and colleagues say. Last summer, Hussein had to wait 72 hours for medical attention after breaking his arm in a fall. Though the arm was poorly casted and the pain worsened, Hussein was denied surgery and a casting change. Baher Mohamed is certain that international pressure has an effect on the Egyptian authorities. After he and two other colleagues were jailed in Egypt in 2013, a global campaign joined by other journalists, human rights groups and foreign governments helped secure their release. 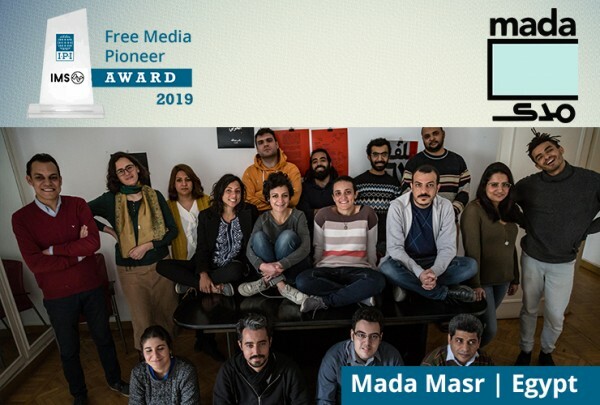 “I’m 100 percent sure that the pressure on the Egyptian government and the unity that we saw from the journalistic community to free the three of us was the thing that led to me being a free man”, he told IPI. Mohamed urges everyone to take part in efforts to free Hussein and to pressure repressive authorities all around the world into releasing journalists and allowing the media to do its job without fear. For her part, Aya Hussein said it hurts to have to turn to the international community for help. First, she believes that Egypt should respect its own citizens. She is saddened by the lack of support the Egyptian media is showing her father. And she insists that journalists should not pay the price of the ongoing conflict between Egypt and Qatar. “His being an Egyptian and a journalist, a guy who hasn’t done anything wrong, should be enough reason for the Egyptian government to release him”, she said. Second, Hussein regrets having to ask other countries to stand against her own, a place her father taught her to love. “I want the relationship between my country and all the other countries to be very good”, she said.